There is something special about holiday traditions. Every year I watch A Christmas Story. I don't really watch it anymore, but rather listen to it on an endless loop while decorating or baking or wrapping presents. But nonetheless, the DVD is out every year. The same applies to holiday books. Every year, my mother would give me books for Christmas. Usually a book or two for my reading level, but I always received a beautifully illustrated hardcover children's book which had an inscription written in the front cover and dated. We follow the same tradition of books with Little Tomato. This book has become a new favorite around here. I am a sucker for anything illustrated by Jon Muth; not only do you have frame-worthy illustrations, but the stories are almost guaranteed to be spectacular. Beautiful illustrations and a simple story of compassion and love for others. This is my favorite Christmas book of all time. 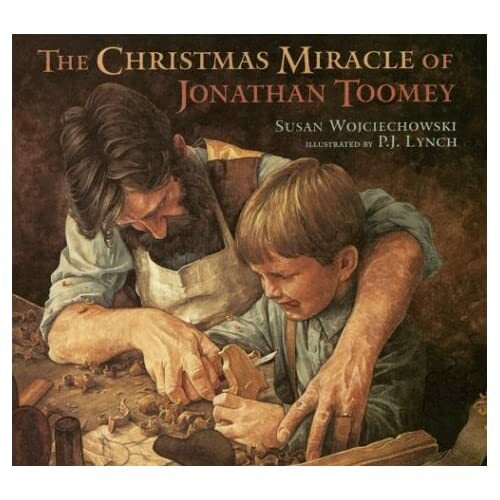 If I could own only one Christmas book, this would be it. A sad, reclusive woodcarver is visited by a widow and her son. They are new to the town, and she has realized that her family nativity set is gone. She asks the woodcarver to make her a new set before Christmas. He grumpily accepts the job, and is visited the following week by the widow and her son- the boy wants to watch him carve. As the woodcarver works, the boy teaches him about his nativity set- each figure and why it was special. Slowly, as each visit approaches, the woodcarver is softened by the kindness of the widow and the joy of the boy. The illustrations are warm and heartfelt and the story is lyrical and poignant. My recommendation: Get an early edition! The newest edition has done a hatchet job on the illustrations, both shrinking and cropping them. I was beyond disappointed to see this. The 1995, 1998 and 2000 editions look to have the full sized illustrations. 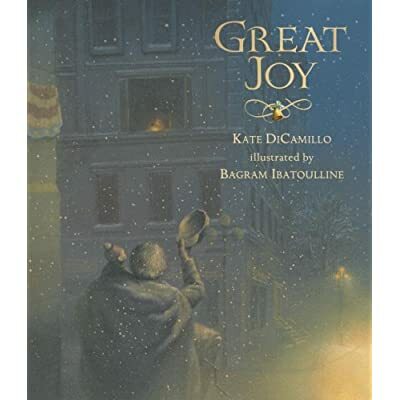 Do you have any favorite Christmas books?